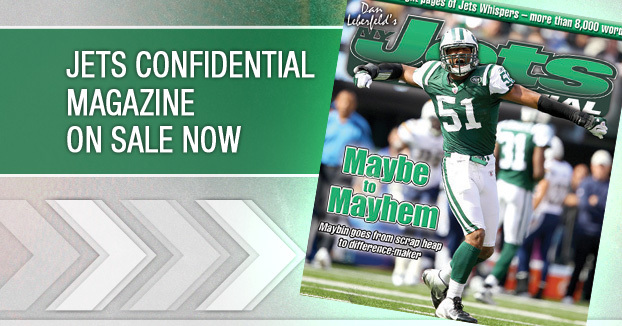 One Jets Drive – Dan checks in from the Jets Atlantic Health Training Complex with a helping of Website Whispers . . .
Santonio Holmes doesn’t think the Jets should get overlyconfident following their win over Kansas City. “That game was too easy for us, no disrespect to Kansas City,” Holmes said . . .
Holmes snapped a reporter today who asked him about attending Brandon Moore’s charity event in Newark. Remember, Moore and Holmes had an issue early in the year, when the wide reciever said the line needs to block a little better. For Holmes, dealing with the media is like root canal . . . If one of the Jets starting safeties (Brodney Pool or Eric Smith) goes down with an injury, the Jets could have some issues. The third safety, rookie Tracy Wilson, is still learning the system. “It’s still a process,” Wilson said. Wilson’s is a little bit of project. First of all, he’s only 22, and left Northern Illinois after his junior season, so he wasn’t a four-year player in college. He seems to have a nice upside, but right now, Emanuel Cook would really come in handy. 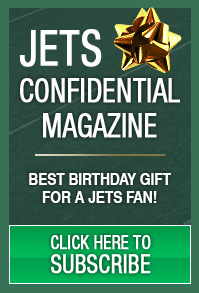 He knew the system, but the Jets cut him a couple of weeks ago because they thought he was dogging it in practice. Cook was claimed by the Baltimore Ravens . . . The Jim Leonhard injury had an impact in the second half of the Kansas City game. There was a blown coverage on a pass to Dwayne Bowe in the end zone in the fourth quarter. The receiver was wide open, and Mike Pettine said there was some confusion in the end zone, and Leonhard’s mid-game departure contributed to it. Bowe couldn’t hold on to the ball, but he was wide open . . . The media gets to interview the players in the locker room after practice during the week. In order to get to the locker room, you have to walk through the indoor practice facility. Almost every day we take this walk, we see one player left on the field, catching extra passes on the jugs machine; it’s Jeremy Kerley. The kid has a great work ethic . . .
Keep an eye on this mismatch; Eagles rookie center Jason Kelce against Jets nose tackle Sione Pouha. Kelce is just 280 pounds, so Pouha has 45 pounds on him. Sione should be able to push this guy around. Expect the Eagles to give Kelce guard help, and this should help Jets ends Mike DeVito, Mo Wilkerson and Marcus Dixon get some favorable matchups. And it doesn’t helping Kelce is that he has a rookie at right guard next to him, Danny Watkins (remember, the former Canadian fireman, who the Eagles picked in the 2011 first round). Watkins was a college tackle, and has been inconsistent at guard as he figures out the position. The Jets should be able to take advantage of the Kelce-Watkins combo . . .
Another matchup to keep an eye on; Shonn Greene against the Eagles undersized linebackers and strong safety. The Eagles play a 4-3 front, and their two outside linebackers are rookie Brian “Shake, Rattle and” Rolle (5-10, 227) and Akeem Jordan (6-1, 230) are basically around the same size as Greene. Also, strong safety Kurt Coleman, is just 195 pounds, very small for the position. Look for Greene to be a living nightmare for these guys and break a myriad of tackles. Greene always runs hard, but expect a little more juice from him this Sunday. This is a homecoming game for him. He’s from Sicklerville, N.J., which is one of those Southern, N.J. towns which is basically a Philly supurb. He’s going to have a ton of friends and family at the game, and will be extra pumped to play on his home turf . . .
Mike Westhoff thinks a lot of TV commentors are oversimplifying the concept of “kicking away from DeSean Jackson.” Westhoff says it’s not that easy because the Eagles rush in a way that makes it tough for the punter to direct the ball to the sidelines. Speaking of TV commentators, pictured above, are a myriad of sports media critics, including Phil Mushnick, Neil F. Best and Bob Raissman.